We were overjoyed to have the chance to make Jordyn and Manny’s stationery vision come to life and even more thrilled to see how beautifully the couple’s special day came together. 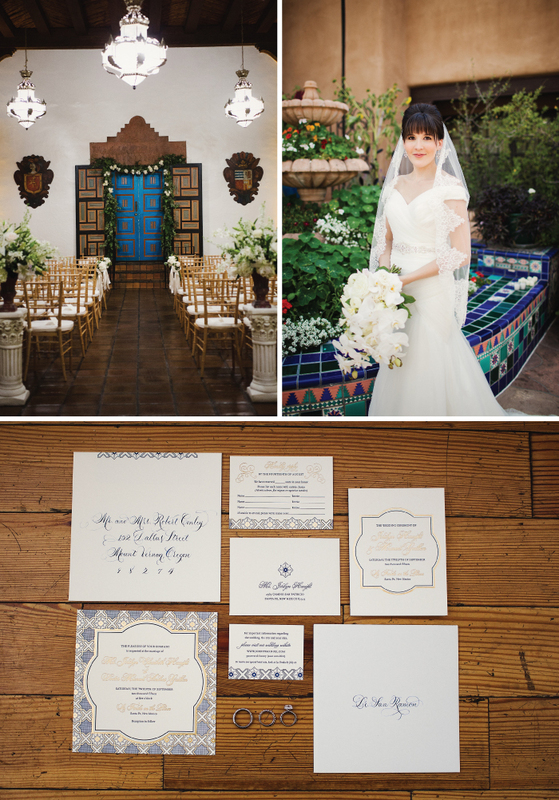 The Amadore Antique design reflected their wedding perfectly with a Spanish flair, dressed up in navy letterpress and gold matte foil, colors that were accented throughout the day. 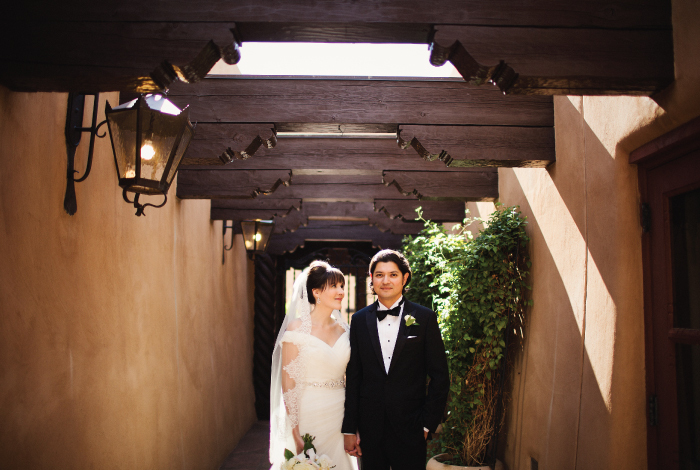 The wedding was held at one of the oldest hotels in the United States, La Fonda on the Plaza. 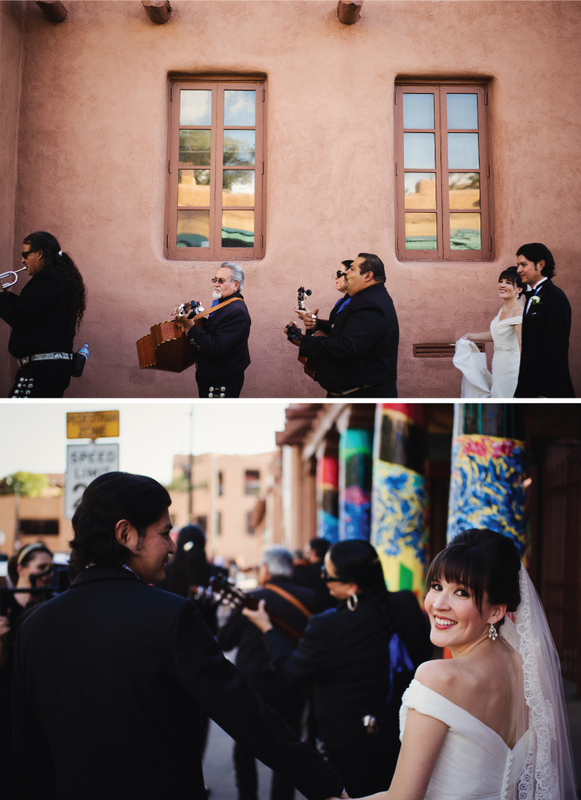 Jordyn and Manny’s guests were surrounded by Santa Fe traditions like a live mariachi band promenade through the plaza and personal touches like a surprise recording of Jordyn singing “The Nearness of You” as a gift to Manny. What was the inspiration for the wedding? What sort of look/feel were you going for? We discussed weddings, what they mean, and what we want them to communicate to the world. I thought weddings should focus on the joy and solemnity of the commitment, while Manny envisioned a grand celebration to be shared. Everything began to take shape from these conversations. My vision for the wedding took on a polished and glowing aesthetic with old-world Spanish charm. The first time Manny and I spoke was because of the t-shirt he was wearing that he bought from Spain and it just so happened that I lived there while I was in college. Two nights later, he took me on our first date to a Spanish restaurant. His family is Mexican-American, so we also wanted to include their heritage as well. We had just moved from El Paso, Texas to Santa Fe, New Mexico, a storied place born of the intertwining beauty of these cultures. It was the perfect location and an exciting destination for our guests. What were some of your favorite parts of the day? Every part of the day was special, brimming with anticipation and meaning, but without question, the happiest moment was our vows. I was filled with the most profound, total joy and sense of peace. That’s fitting I suppose, since those are the adjectives I wrote down to describe our relationship, back in Belize during the first days I wore our ring. Advice to future bride’s planning their own wedding? First, DIY doesn’t have to mean make-it-yourself. I think of my wedding as hand-curated, not hand-made. Craft projects take time and skill and I didn’t have either. Consider your talents. I’m a singer, so I recorded a song that is special to us. I didn’t go to a studio instead I bought a quality mic off Amazon and recorded it in my closet. I think that definitely counts as DIY! Always keep the guests’ perspective in mind as well. We hated to make everyone travel to our wedding but given the far-flung nature of our clans, it was necessary. In thanks, we took their comfort, happiness, and convenience into account in every detail. Lastly, evoke what seemed magical about weddings when you were little, even if you’re the only one who will notice. Cascade bouquets were all the rage during my childhood in the 90’s, and I was captivated by them. I wanted a Pinterest-worthy wedding, though, so I ordered a hand-tied bouquet instead. At the last minute, I changed to a cascade. 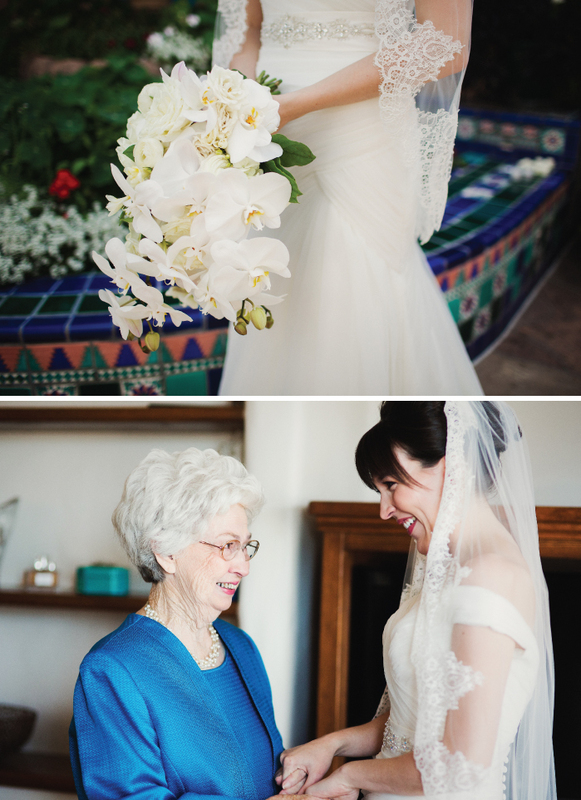 I really felt like a bride when I held it for the first time, and I still feel that magic every time I see a photo. Many personal details precious to us enriched the night. My late grandfather gave his wife a gold locket on their wedding day in 1949. She cried when she saw that little something borrowed pinned to my bouquet. At 87 years, her presence with us that day was absolutely priceless. My brother is a competitive pistol shooter, so I gave him 9mm bullet cufflinks at the rehearsal dinner that he wore the day of the wedding. The groom gave me a gold necklace with my new monogram and I gave him a collection of boudoir photos. A conch shell from Belize held flowers with a photo of Manny and I from the proposal on the favor table. Even the last moment of the night held a special surprise with a recording of me singing “The Nearness of You” playing for our last dance. I love the soft look of all these photos and details. Wonderful photography!